Clare Travers, Film, Review this. A few months ago I, along with several hundred other people, paid a cosy $70 to sit down and listen to the ever-sublime Cate Blanchett be interviewed onstage at the Sydney Theatre Company. I had spontaneously come across the chance to be a part of ‘An Evening with Cate Blanchett’ during my internet wanderings one slow morning at work, and had quickly clicked my way through to the purchase of a ticket before the sensible voice in my head had a chance to question otherwise. The event was a part of esteemed journalist Anne Summers’ series of ‘Conversations’ with prominent figures, having previously interviewed Julia Gillard in September last year, a week after the election. Due to my speedy ticket transaction, I hadn’t organized for company to join. It was going to just be me, Summers and Cate! On the day of the event work was a complete write-off once I remembered the evening involved an audience Q&A. Several pages of potential questions later—heavily analysed and deconstructed from every possible angle: confident but not gushy, intelligent but subtly so, interesting though not insipid— my stomach was in quivers as I mentally debated all afternoon whether or not I would actually have the nerves to ask her anything. Upon arrival, the emcee was typically stilted and dry and the introductions seemed to last a lifetime. Anne Summers came onstage and took a seat, with the crowd was buzzing with anticipation. Before too long, she was announced and the effervescent Cate was suddenly striding out onto the stage, smiling broadly and waving a friendly hello to the crowd. Everyone clapped uproariously and then settled back into their chairs with a collectively contented sigh. While the crowd (myself included) attempted to adjust to suddenly being thrust into the presence of greatness, the interview began with an opening query regarding Cate’s recently concluded five year tenure as joint CEO and Artistic Director of STC, alongside her husband, Andrew Upton (who continued on as sole artistic director as of September 2013). What first drew them to consider the career shift included a desire to engage with their own culture once more. Having lived in England for several years with their young boys, they both felt increasingly like ‘cultural tourists’ and were keen for the opportunity to internationalize the company’s profile and also to ‘green’ the organisation. Once they arrived at the STC the first thing they did was remove the big, wooden desk out of their office. They wanted to enable an open space for creative conversations to take place while they were at the helm. It was surprising to me, that the single entity Cate immediately volunteered as the thing she was most proud of during her time there was the ‘greening’ of the wharf. Completed in December 2011, the Greening the Wharf project included the installation of Australia’s second largest solar panel array and a number of energy efficient lighting and rainwater harvesting systems. There have also been a number of community engagement measures put in place to inspire individuals and corporations on the importance of environmental sustainability and also to raise awareness throughout the wider wharf precinct. Cate was asked about her heavy involvement in both live theatre and the international film industry, and remarked upon the debilitating structure that tends to surround filmmaking. She said it has a tendency to almost infantilize you, where you become an object to be both pampered and scrutinized, in a way that dislocates you from the audience. Conversely, you are able to have incredibly robust relationships with the audience when working on stage, a shift she found incredibly enjoyable. Topics continued to range from fashion on the Red Carpet, having recently finished the exhausting run of awards shows including her successful Academy Award win for Best Actress in Woody Allen’s ‘Blue Jasmine’, to being a working mum. I found some of the questions to be a little predictable and irksome. However, Cate took everything in her stride and was completely charming throughout, wooing the pants off everyone present with her razor-sharp wit and self-deprecating humility. What is it like being on the red carpet for all these awards shows? How do you reconcile living in two worlds, as both a mum and a famous actress? Hearing her describe the ways in which she both approaches roles and also considers her own abilities was fascinating. She commented on how she lives in a state of, “blessed unrest”. She tries to never remain in a static point, always picking apart aspects of her performances she’s not happy with, which continues to propel her forward regardless of the critical reception she receives. Cate commented on the way in which living with the character of Blanche DuBois in Tennessee William’s Streetcar Named Desire for so long helped with the preparation for her role in Woody Allen’s Blue Jasmine, and how there is a residue of each character she plays, that continues to stay with her. She described acting as being a compassionate profession, as opposed to an indulgent one, where you have to put yourself wholly in someone else’s shoes in order to try and understand how they uniquely see and experience the world. When discussing the lack of prominent roles for women in Hollywood, Cate suggested that it’s the marketing departments that have control over most film studios today. She names this an era of big budgets coupled with intensely conservative studio executives, which has been significantly inhibiting industry progression. She also added that it’s a complete misnomer that the only true film audience is one of 12 and 13 year old boys, that audiences are capable of experiencing complex characters, both men and women. “Now, I don’t know where Frozen sits in all of this…”, she added, to the delight of the cheering audience, describing it as, “a simple story about two little girls”. A simple story that became one of the highest grossing films of all time. She emphasised that the stigma and shame experienced due to gender inequality needs to be eradicated. As we came towards the end of the formal interview, Summers asked Cate who or what inspires her. Cate responded with how available and un-self-conscious children are, before also mentioning dance, music and visual art. A simple, yet completely intriguing and articulate response. Now, I’m sure you’re wondering by now, what ever became of the audience Q&A? When the call went out to the audience to line up if they wanted to ask Cate a question, I took a deep breath and jumped up. As I stood waiting in terror, I scanned the other microphones stationed around the audience and saw that I would be around fifth in line to speak. Mind buzzing, I couldn’t really hear the other questions that were being asked. By the time it came to my turn, I could feel the silence; the audience shifting in their seats to see me, a spotlight hit my face, and Cate herself looking up at me. I sucked in some air and quickly introduced myself as we’d been told to do. In an upbeat and horrendously casual manner, entirely removed from the reality of the situation, I preambled, about how I had kept myself busy at work that day reading through old interviews she’d given. Cate laughed and said that I was probably all up to date! I replied that I probably knew a bit too much, which caused the audience laugh. I went on to ask her about what types of role has she taken on in the past that had absolutely terrified her, referencing comments she had made regarding a phone call she’d had with Martin Scorcese about taking on the role of Katherine Hepburn in The Aviator back in the early noughties. Unfortunately, especially for this piece, I can’t exactly tell you what she said at this point. Something about the importance of the script, crew and director, as well as the fact that she generally approaches each role the same way. You just bantered with Cate Freaking Blanchett and made the audience laugh. Focus. Stay cool. Don’t do or say anything embarrassing. Keep it together for just one more minute. And I suppose I did. And then, all too quickly, my moment was over and I quickly sat back down. More audience questions followed, including one that involved an American women seizing the opportunity to advertise her talented son’s budding film stunt career and asking Cate for advice on how to get work in the industry. And soon, the night was over. After the thank you speeches were made and the flowers were handed out, the lights went up and Cate eventually headed off stage. I slowly made my way back out onto the street, dawdling about in the foyer for a couple of minutes, in no hurry to head back to the train station that would take me home, where I would go to sleep and get up way too early in order to trek back to work. I soon left and walked alongside the water back towards the city, where I noticed Cate striding down the other side of the road, trying to catch up with her husband, Andrew, probably on the way to a fabulous post- show supper. Within moments a couple of photographers and passers by sprinted towards her in an attempt to take photos with her. Cate attempted to politely decline but the aggressive insistence of those around her caused her to acquiesce and she smiled and posed briefly with a couple of children (pushed towards her by their parents). She soon broke free from the crowds and continued on with her vigorous strides up the street to meet the rest of her party outside a sumptuous looking restaurant. And me? I continued to wander through The Rocks and back to Circular Quay where I treated myself to a Guylian hot chocolate and sweet cinnamon pastry. 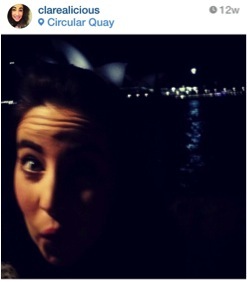 I sat down outside the beautiful Museum of Contemporary Art, overlooking the Opera House and sparkling city lights. I thought about the excitement that can be found in being a little bit courageous every now and then, even in something as simple as going places without your usual go-to company. The freedom to enjoy a fabulous night out with you and your own thoughts. And, if you can somehow combine it with an evening with Cate, by all means, do! 2. Cate’s acceptance speech at the 2014 Academy Awards. 3. Her interview with Ellen the morning after she won. 4. Cate trumping David Letterman at his own game. Top image via The Sydney Theatre Company. This entry was posted in: Clare Travers, Film, Review this.